The Summer Mini Catalogue can now be viewed online here. We have some fantastic new product lines including Smooch Spray and Presto Patterns Specialty paper. 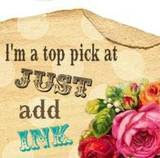 The stamps sets and new Designer Series Papers are of course gorgeous plus we have a new border punch (happy dance). If you would like your own copy of the Mini Catalogue or to book your Summer workshop and see some of the new products in person be sure to contact me.